On 11 July 2017, ZS6APS Jimmy, OM of Pam Momberg ZS6APT, unexpectedly went Silent Key. Pam is a long time YL operator (she was Sec. of SAWRC 1978) and she and Jimmy always worked as a team. 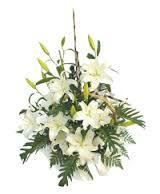 We send sincere condolenses to Pam and family, and the Centurion Radio Amateur Club – he will be missed. 08-10 Sept ALARA meet in Cairns, Queensland, Australia. Lesotho, 7P8 Sani Pass region, will be active 2017 18-21 Aug by Quintus, ZS2KU/ 7P8QM and Vaughan, ZS2VR /7P8VRR 40 20 15m; 100w; dipoles. 9 August 2017 from 0600-0700 UTC [0800-0900 SAST/local] No scoring, no logs. South African Radio League YL Sprint- 9 August, 2017. Scoring - Contacts between YL stations are worth 5 points; contacts between YL and OM stations are worth 3 points, and contacts between OM stations are worth 1 point. ELIGIBILITY: All licensed operators throughout the world are invited to participate. OBJECT: To encourage YLs in the use of amateur radio. YLs work everyone; OMs work YLs only. Contacts made on ECHOLINK and TWO METRES will also be accepted. (Separate logs for these would be preferred). 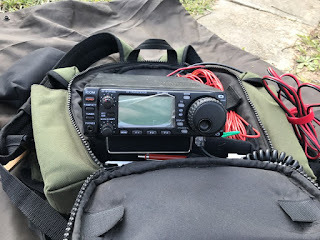 RaDAR – Rapid Deployment Amateur Radio, was launched in August 2009 from an earlier idea known as 'shack-in-a-sack”. Initially it was a requirement to walk at least one kilometre carrying all station equipment, antennas and logistics to the operating position. There was no time limit so the essence of deploying quickly was not there. The highlight is the “moving” aspect of RaDAR which makes it different to other amateur radio activities. 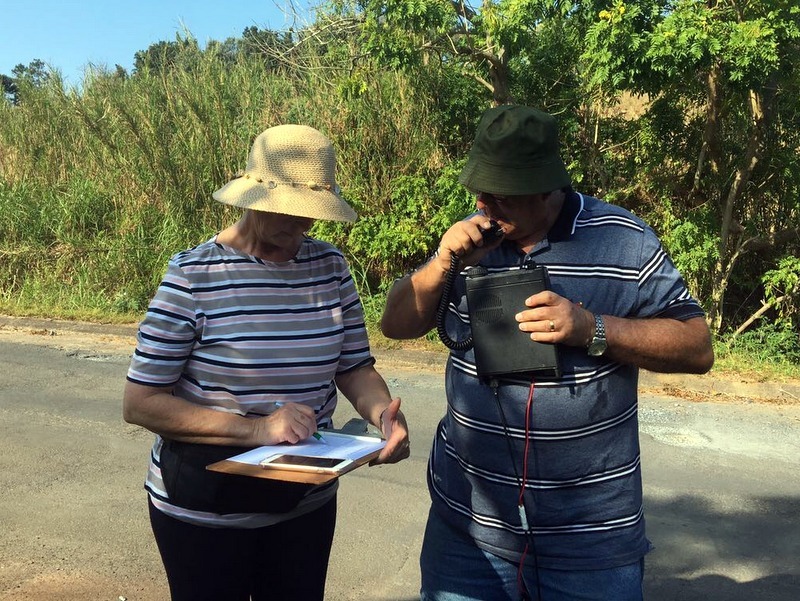 It's more than just making QSO’s, it’s a challenge to rapidly set up an effective station, proving it works by making 5 contacts, packing up, moving and doing it all over again. RaDAR promotes all modes, although the use of terrestrial repeaters is not allowed for contests. RaDAR promotes survival and fitness. 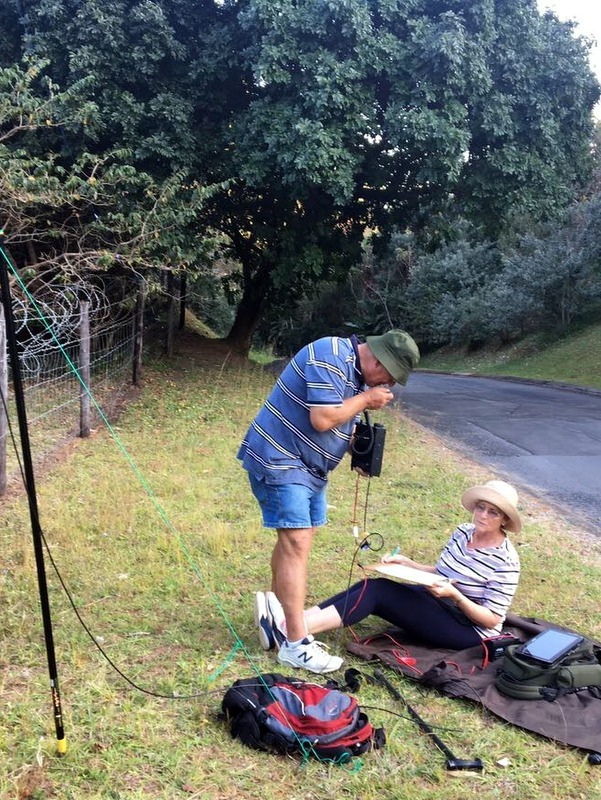 Radio amateurs need to get out of their comfort zones and put themselves into real life situations if we are going to be of any value “when everything else fails”. 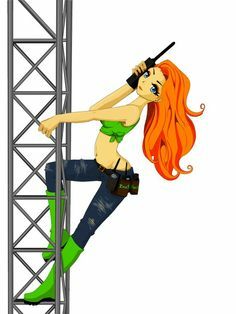 It’s not until one gets out of the “shack” that one realises the need to be practised at being able to communicate almost as effectively as we do running high power into high gain antennas with grid-power. Take that away and you’re left with a “bare bones” system which may feel uncomfortable. This was my (ZS5APT) and Sid’s (ZS5AYC) 2nd attempt at doing the ‘walking RaDar Challenge’, our first attempt in November 2015 was a dismal affair. It was a wet, windy and a totally miserable day here on the South Coast, I opted to stay home, but Sid wanted to know where my sense of adventure was, so armed with a beach umbrella to protect the radio equipment, we drove down to the beach, apparently the sea is a good reflector, I landed up fighting the wind to keep the umbrella over the radio and not being turned inside out. The 1st point (Lucien Beach) we managed one contact and that was just readable, we decide to move to a more sheltered spot between the rocks on the Lilliecrona Blvd, unfortunately the only success we had was getting drenched. What a sorrowful sight we must have been, two bedraggled amateur radio RATS (RaDar Active Team Sport). Equipment was dry and the coffee and rusks were great. 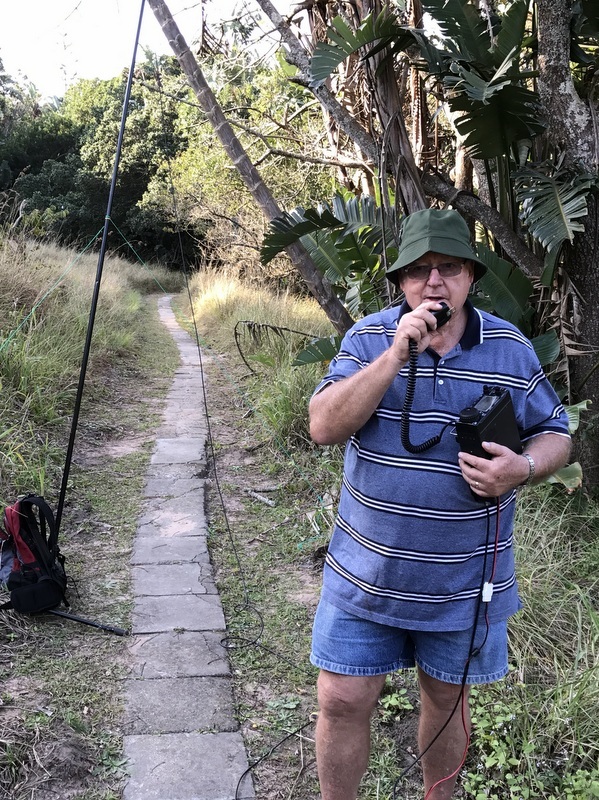 This time we were going to walk in the Umtamvuna Nature Reserve with members of the ZS5HAC (Hibiscus Amateur Radio club) manning a base station, Sid went during the week to get a map of the walking trails so that we at least had a plan of action, unfortunately the veld had been burnt so that was a no go. The decision was made that Jan (ZS5JC), Emmie (ZS5EB) and Herman (ZS5LH) would do a mobile RaDar challenge working as a club station, while Sid, myself and our son Craig would do the walking RaDar, walking from our QTH to the Skyline Nature reserve and then doing the circular hiking route within the reserve, with 12:00 – 16:00 utc being the allocated time to walk as the Sharks were playing the Lions and Craig is an avid Shark supporter. Because we love doing SOTA (Summits on the Air) we have worked out a routine that works well, once we are at the activation point, Sid starts erecting the antenna and I set up the Icom 703, battery, coax etc. and of course I log the contacts, by the time he is finished with the antenna we are ready to call cq. This usually takes about 10 minutes, depending on the location. RaDar – 15 July 2017 At 12:00 Sid decided to set up the station (KF59EE61NA) in our garden as I was still busy getting ready and ensuring we had adequate water and snacks. Jan was Sid’s first contact (bonus point RaDar to RaDar) with me giving him his 2nd much to his surprise. After our 5 contacts we packed up and started walking towards Skyline for the 2nd activation point (KF59EE62MM), we set up station and within 7 minutes Sid had 5 contacts. We moved to the 3rd activation point and had to back track as the picnic area was not suitable to set up a station. Once we had setup (KF59EE63MM) it took 15 minutes before we had our 5 contacts, but reports were not good. The 4th activation point was on a pathway (KF59EE63FI) there was a lot of QRM and QRN after 22 minutes we had made the 5 contacts and decided we would visit my brother-in-law who was pet sitting at Skyline. We set up the 5th activation point outside Skyline and within 7 minutes had made 5 contacts; unfortunately we couldn’t walk another kilometre to activate a 6th point as we had run out of time. Moral of the RaDar story don’t stop to chat. Looking forward to the November’s RaDar Challenge we will be visiting our son in Nelspruit and will be either mobile or walking in the Hazyview area. Explanation of local words: veld = fields; Sharks and Lions – local rugby teams. Lucien Beach, Margate, and Skyline Nature Reserve, inland of Uvongo, are both located on the South Coast of KwaZulu Natal, South Africa. Nelspruit (Mbombela) is in northeastern province Mpumalanga, SA and Hazyview is nearby and close to the Kruger National Park. 9 - 13 August Robben Island ZS9V activation. 21 August Total solar eclipse across USA, in other countries only a partial eclipse.